Finally India’s first 3G mobile service operator Mahanagar Telephone Nigam Ltd (MTNL) joins the bandwagon of Pay Per Second billing and announced its unique PAY PER SECOND Tariff for its 2G and 3G GSM prepaid customers in Delhi-NCR and Mumbai telecom circle dubbed as “Trump Pay per Second Tariff Package”. 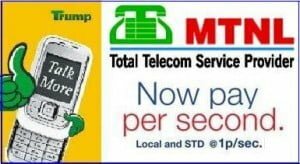 With this plan MTNL Trump Prepaid subscriber can make MTNL2 MTNL Local and STD at just 1/2 paisa/ Sec (Half Paisa Per Second) and for Other Network Local and STD calls will be charged at 1 paisa /sec. The above tariff plan will be applicable from today. If the call charge for a call is in fraction of paisa it will be rounded off to next paisa. All other call rates and terms and conditions will remain as per the prevailing Trump plan of the subscriber. After recharge with Rs.45 pay per second Tariff package all benefits of any other tariff package recharged earlier will be reset and the benefit of this pack will prevail. The tariff of this tariff coupon will be applicable for 365 days. However the main account validity will remain unchanged. Thus the Tariff of this tariff coupon will be applicable for the validity of the main account or 365 days, whichever is earlier. Only Trump SMS package can be used simultaneously with this Pay per Second Tariff package. If Customer recharges with any other tariff package like Trump local pack/ STD pack or Combo pack he will exit Trump Pay per second plan. This tariff coupon will modify only voice call rates for 2G customers and voice and video both for 3G customer. Which means it is not a conversion coupon for 2G to 3G conversion.